Yesterday I got the package of yarn back from my Learning Exchange group. It was just yarn, the evaluations will come later apparently. So now I have a sample from everyone in the group who finished. Some did not, so there are only ten samples out of the original thirteen members. The coordinator wrapped everything up nicely in tissue and a lace ribbon and included a handwritten note. The entire package was lovely, and it was great fun to go through it all and see what everyone had done. I like to see other people’s yarn. I want to see not only what other people are up to, but how they approach yarn design. This group had a range of spinners, from two to twenty-five years of experience, and the yarns were of all sorts of kinds of Merino. Raw fleece (some from personal flocks,) small-lot mill carded and the ever-present Ashland Bay. There were blends with silk, angora and mohair and yarns both fluffy and smooth. Most were two or three ply, but there was a single and my 4-ply. Some spinners measured angle of twist but most didn’t, one participant included an extra sheet describing the different scouring methods she tried. Scouring is important for Merino, because it has way more grease than pretty much anything else. I don’t know how long it will be to get the evaluations, but the group leader has all the materials so things should be coming along. I’ll post more later. Posted by feorlen on 30 June 2006 at 12:26 pm under spinning. So that was the easy part. I looked at some other things that might need to be de-rusted and determined that it’s a good thing I don’t expect to do a lot of funky chunky warps. The 5 dent carbon steel reed is a mess. Many of the other metal parts have some sort of powder coat finish (think metal computer boxes) so they aren’t a problem. But the harnesses are frightening me. Heddles are designed to go on the loom all the same way, so that when you thread them the eyes all face the same way. You don’t want to accidentally thread one in the wrong direction and have your warp snag on an errant heddle. Bad news. I guess the previous owner was a novice weaver when she got this loom, because they are put on in little clumps of this way and that. Basically half of them are randomly upside down. I need to shuffle a bunch of heddles around anyway to get them distributed the way I like, so I’m going to take them off and put them back on all the same way. Because most of you probably have never owned a big floor loom, this is, shall we say, a non-trivial operation. There’s over a thousand of those suckers, spread across twelve harnesses. I managed to empty one. The general process is to put a big needle on either end of a cord and thread both ends of the heddles on it as they come off the harnesses. And I’m constantly switching which needle takes the top or bottom end of the heddles. Eventually they all come off in the right order and in the right direction, neatly threaded on a string. I’ll get that done and then start thinking about actually counting them. Yikes. Posted by feorlen on 29 June 2006 at 9:43 pm under weaving. The diz experiment went well, although I need to do something about getting a better diz. The plastic jug is ok for thick stuff but that’s about it. It’s too soft, so the hole gets larger as you go. Not good. I tried using a button, which was better, but it’s hard to work with. Not only is it just difficult to hold, but since it’s so small I end up grabbing fibers on the other side when I’m not supposed to. Believe it or not, the hole is too large as well. Time to go shopping, or maybe something will turn up at a thrift store or random junk pile. You never know. Posted by feorlen on 17 June 2006 at 4:53 pm under spinning. This brings up the never-ending discussion on which end to spin from. 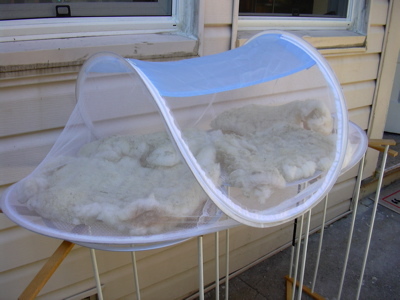 When I comb or flick fleece, I spin from the cut end. It just works better for me. Some people spin from the tip end. I did an experiment and tried spinning from both ends of the same hand-combed top. I also used short backward draft, my usual, and short forward draft. Either way, spinning from the cut end makes smooth yarn and spinning from the tip end doesn’t. I can’t smooth it out and the fiber just feels nasty in my hands. I thought that maybe the no-deathgrip-pinch short forward draft was the difference, but no. Many people also say it matters which end of a commercial top you spin from, too. I can’t tell the difference with short backward draft and only a little with short forward draft. I do notice it more with cotton, but not only is that an entirely different kind of fiber structure and size, but a different spinning technique. You can’t do any sort of worsted short draft with cotton, there just isn’t enough length to be able to pull out half a staple length with your fingers. I keep trying all these things to see what people see in them. Once in a while I find something that really works for me, but mostly I just wonder what all the fuss is about. I’m all for understanding traditional methods, but that doesn’t mean I’m going to just assume that is the best and only way without checking things out myself. Posted by feorlen on 13 June 2006 at 6:04 pm under spinning.